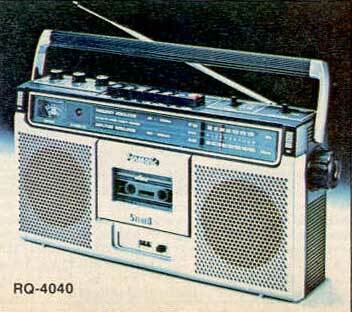 Panasonic’s top of the heap in the late ’70s was RX-5040. This was one of the first systems that included an led meter for signal & battery strength. A sure sign of quality was the array of inputs and outputs included. This stereo was made for true integration into a home stereo. For some reason, these functions seemed to disappear as the years progressed. Conic wasn’t exactly a symbol of electronics excellence, but this multi-band is pretty neat. 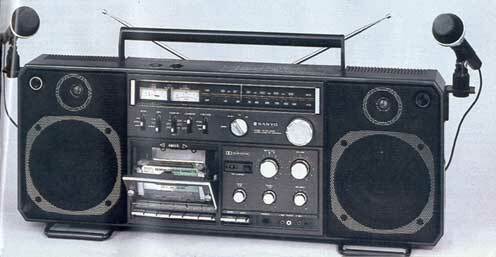 It may very well be the first boombox featuring detachable speakers and it boasted AM/FM/SW/LW reception. Sound quality probably wasn’t too great with those 2 1/2″ speakers, but who cares! 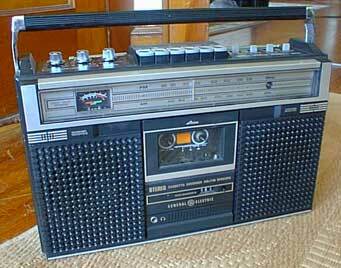 GE was one of the few companies offering a solid portable stereo cassette recorder for an affordable price. While is wasn’t particularly rich in features, it did have all the basics: separate left & volume controls; stereo switch; “digital” tape counter; signal strength/record level/battery meter; the forgotten neon orange square to aid in marking tape position. We were just happy to find this 20+ year-old Sanyo M9980 “in the wild” and in super shape. Notice the twin meters; the little yellow button above on the left controls a light for them. 1978 Sony CF-520. 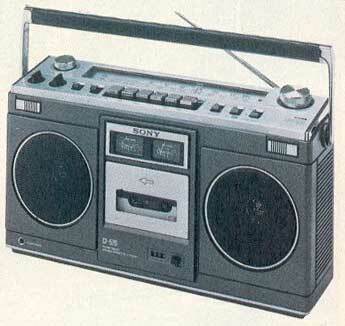 One of Sony’s first boomboxes with most of the same features of the above, but certainly improved aesthetics. 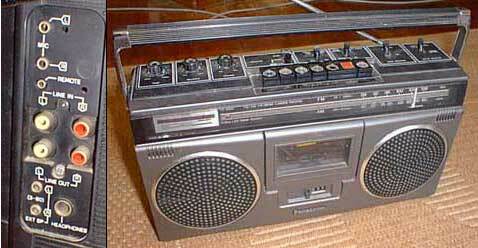 Arguably, Sony enlightened the industry with cool styling causing the boombox trend to catch fire in the late 70s and early 80s. 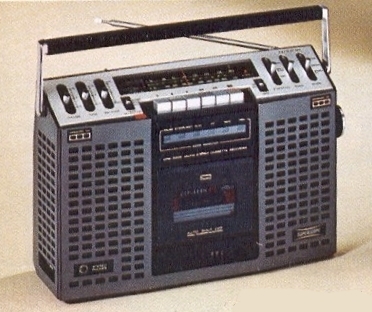 Panasonic clearly dominated the boombox market around the turn of the decade; quality and performance were the benchmark for other companies to match. This is one of their earlier models, the RQ-4040. This boombox weighed in at a whopping 12lbs, not including batteries. Despite its weight, it was small when compared to models released a few years later–less than one foot in height. We notice that this was par for the course for the early systems, very heavy and solid, in a not-so-large package. These radios were durable, and we’ve had good luck finding them recently in working condition. 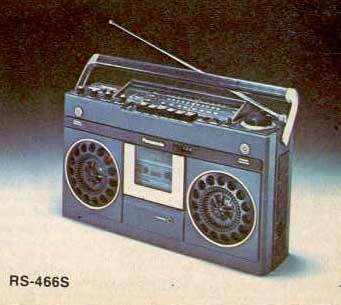 Panasonic’s RS-466S, a hip model from 1979. 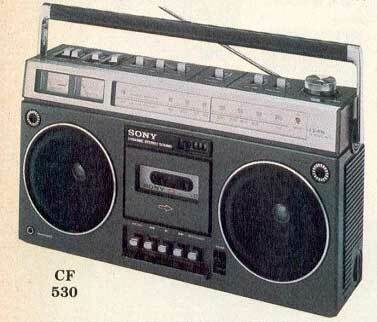 Boomboxes were becoming mainstream at this point. 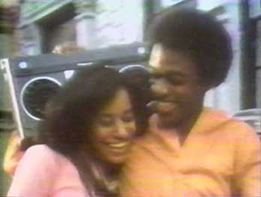 Here’s a shot from a 1979 deodorant commercial featuring the very same model to prove it. Marantz Superscope. Few style points, but great quality from a leader in magnetic tape technology. 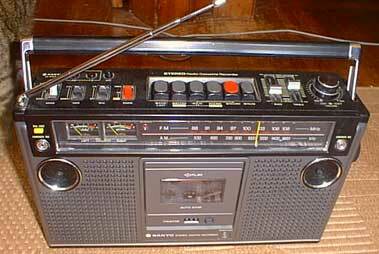 AM/FM tuner, cassette recorder, “stereo matrix” (wide effect) through its 2-way, 4 speaker system. There were one-speaker mono predecessors, but this is the earliest we found to fit the configuration of what we now know as the boombox. Sold for over $200 in 1976.